Real Name: Captain Nathaniel Banner, Ph.D. Amalgam of DC’s Captain Atom and Marvel’s Hulk. In 1964 brilliant army physicist Captain Nathaniel Banner was working with the US Government to develop the Gamma Bomb, a deadly new weapon to use against the communists. For testing the bomb, the Army decided to use it on an alien ship they had found years ago in Roswell, New Mexico. The ship was made of an unknown metal but was useless to the government and they wanted to be rid of it. During the testing, a teenager drove across the testing range, not knowing the Gamma Bomb was being detonated. Captain Banner ordered the countdown stopped and rushed out to the testing grounds. Frantically waving his arms he managed to flag away the driver. Seeing the driver was safe and assuming the countdown had been stopped, Captain Banner decided to investigate the alien ship. Unknown to him, his assistant, a jealous co-worker, never ordered the countdown stopped. When the Gamma Bomb exploded, the ship with Captain Banner inside appeared to be destroyed. In reality the metal of the ship had absorbed the gamma radiation and used the energy to move forward in time. 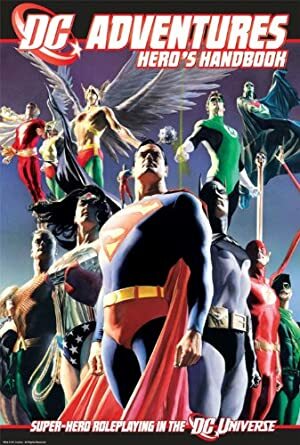 Awakening in 1994 on the now-deserted testing grounds, Captain Banner found that the alien metal had bonded to his skin and somehow given him incredible energy powers, flight, and superhuman strength. He also found that he could absorb the metal into his skin and appear normal. Taking the codename Captain Gamma, he returned to the US Army. 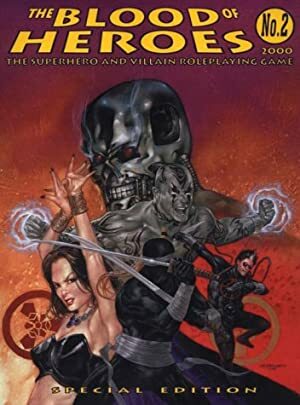 He was made into a super-agent and worked with SHIELD, until he discovered that the assistant that had betrayed him was now a higher-ranking officer in SHIELD and had married the girlfriend Captain Banner had left behind. Leaving SHIELD, Captain Banner set out on his own. SHIELD still retains the rights to Captain Gamma’s code name and appearence, and has released a cartoon based on him. Normal Form – 5’11”, 170 lbs, light build, brown hair, green eyes. 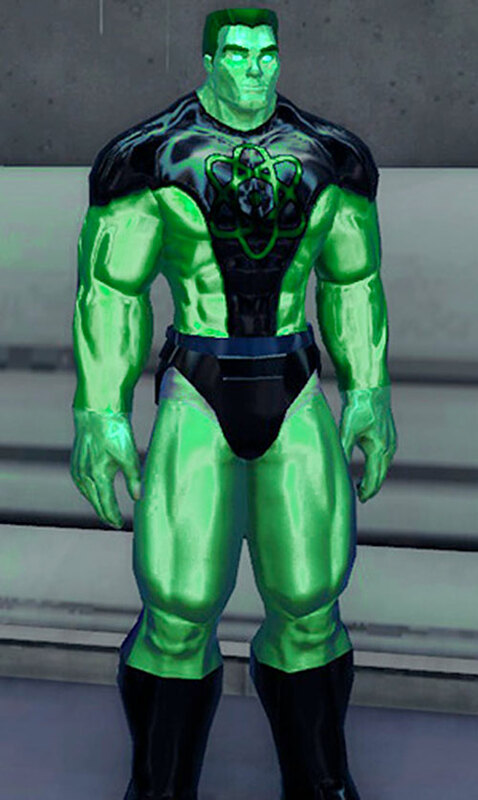 Hero Form – Metallic green skin (like Cpt. 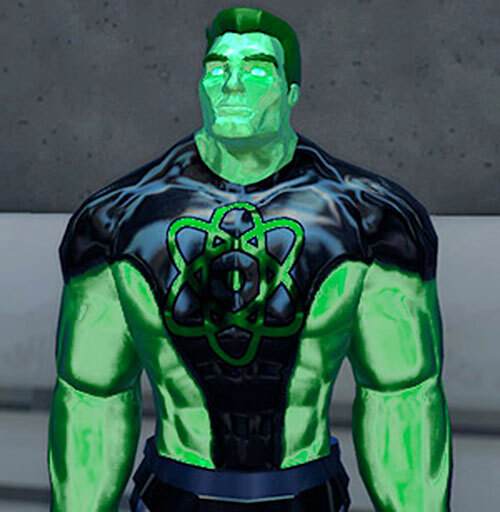 Atom if he were green), Black boots/gloves, Dark green “atomic” symbol on chest, 6’2”, 230 lbs, muscular build, metallic green hair, dark green glowing eyes. Since he’s so proud of it, here’s the entire opening sequence of the smash-hit Captain Gamma and the Gammateers cartoon. “At the end of the twentieth century, Earth was in danger of choking to death on her own poisons.” The scene shifts to show cartoon scenes of city streets full of litter and pollution, and fades into wilderness areas, also strewn with litter and toxic waste. “Earth needed a champion to help save it from it’s own waste. I needed a champion.” Switch to a pretty young woman in a white robe, actually a good likeness of the actress, whom you now remember to be Candice Goldberg. “I am Aphrodite, the spirit of Earth. Man’s waste and pollution injures me. Needing the help of mortals to intercede on my behalf and their own, I summoned 6 teenagers from six parts of the world to be my champions. They then transform into all-over body suits and helmets with full-face visors, each matching it’s wearer’s power color. The teens are shown struggling and retreating from a radioactive waste dump. The teens hold their rings high and the beams form into a multi-colored rainbow, which bursts into the sky, forming a vortex. From the vortex bursts Captain Gamma ! Gonna take pollution down to zero ! You can be one too ! Cause saving our planet is the thing to do ! Looting and polluting is not the way ! A logo proclaiming “Captain Gamma and the Gammateers” flashes over the screen. Adrenal Surge is triggered by Rage. Energy Absorption is actually unlimited – any Absorbed APs beyond 9 propel Captain Gamma an equivalent number of APs of time into the future. Helper(s): Compiled by Scott RC Smith and JD. Illustration by Sébastien Andrivet.